1کارشناسی ارشد مدیریت تکنولوژی، دانشگاه آزاد اسلامی، واحد علوم تحقیقات تهران، ایران. پژوهش و فناوری جایگاه مهمی در توسعه زنجیره ارزش داخلی محصولات زعفران و زرشک دارد. هدف اصلی این پژوهش، شناسایی عوامل مؤثر بر ارتقاء سهم واحدهای پژوهش و فناوری کشاورزی در ارزش‌افزوده محصولات می‌باشد، بدین منظور پس از مرور ادبیات موضوعی در حوزه پژوهش و فناوری کشاورزی، مجموعه مؤلفه‌های تأثیرگذار بر ارتقا سهم این واحدها در ارزش‌افزوده بخش کشاورزی شناسایی و با نظر خبرگان نهایی گردید. سپس با توزیع پرسشنامه ساختاریافته در میان ۶۵ نفر از مدیران و محققان شرکت‌های تولیدی زعفران و زرشک و سازمان‌های تحقیقاتی کشاورزی و با استفاده از نرم‌افزارهای آماری SPSS و smart PLS ارتباط میان گویه‌‌ها و سازه‌ها مورد تجزیه و تحلیل قرار گرفت، در ادامه با بهره‌گیری از روش معادلات ساختاری ارتباط میان عوامل ۶ گانه: تحقیقات کاربردی، اکتساب فناوری، تجاری‌سازی، توسعه بازار، عوامل داخلی صنعت و عوامل کلان ملی بررسی شد. نتایج تحلیل داده‌ها نشان می‌دهد، حمایت از سرمایه‌گذاری شرکت‌های فعال در حوزه کشاورزی صنعتی در واحدهای پژوهش و فناوری کشاورزی مهم‌ترین عامل شناسایی‌شده می‌باشد. در نهایت پیشنهاد‌هایی جهت بهبود وضعیت پژوهش و فناوری و ارتقا ارزش‌افزوده محصولات مذکور ارائه ‌شده است. In this study we investigate the importance of agricultural sector research and technology organizations (RTO) in the national economic system. The main objective of the paper is to identify and rank the factors affecting the promotion of these RTOs share in saffron’s added value. Through the literature review we extracted all the relevant factors that have been mentioned by different researchers. Then, we classified these factors into six components: applied research, technology acquisition, commercialization, market development, industry’s internal factors and national macro factors. We used a Likert scale questionnaire to gather the data about the importance of each factor based on research and technology experts’ points of view. To analyze the data we utilized confirmatory factor analysis and structural equation modeling (SEM) methods using SPSS and smart PLS software packages. The results show that the most important factor affecting the share of agricultural RTOs in a products added value is the promotion of industrial firms to invest in the field of agricultural research and development. Finally, according to the obtained results, some suggestions for improving research and technology have been provided. Shah, A.A. 2014. Knowledge of saffron growers on saffron production technology in Kashmir. Journal of Agricultural Extension and Rural Development 6 (1): 1-4. Alston, M. 2007. Attribution and other problems in assessing the returns to agricultural productivity. Agricultural Economics 25 (2): 11-32. Coordinating Center for Science and Technology for jujube and barberry. 2012. Berberis and jujube Association Council Report. 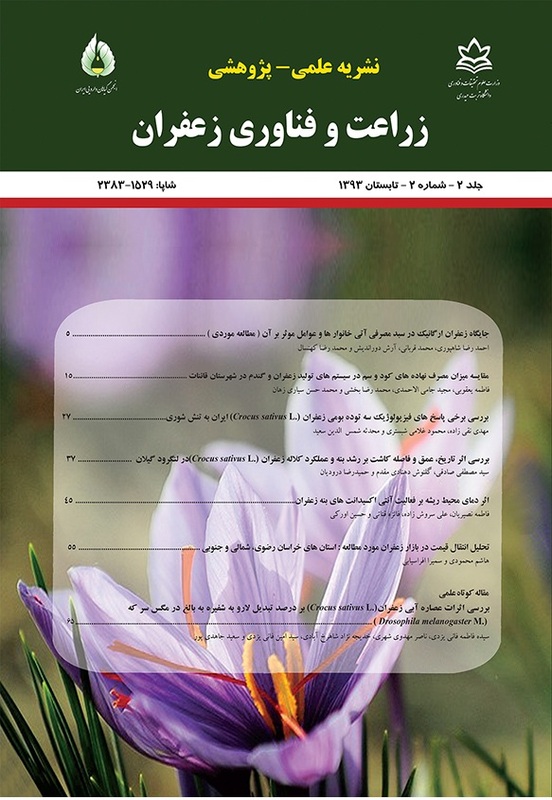 Available at Web site: www.kiccbj.ir (accessed 1 August 2014). (In Persian). Ehtesham, M. 2011. Saffron unknown gem, Chaos Publications, Tehran, Second Edition. (In Persian). Fadaeemanesh, O. 2008. R&D management, Office of Cultural Studies Publications. (In Persian). Farahani, H., Dehkordi, E., and Javani, K. 2012. Stability analysis of the socio-economic production of saffron and its impact on rural development. Journal of Economics and Rural Development 1(2): 95. (In Persian). Fare, R., Grosskopf, S., and Margaritis, D. 2008, US Productivity in agriculture and R&D. Journal of Productivity Analysis 30: 7-12. Heidary, H. 2008. National innovation system as a framework for analyzing innovation: a theoretical approach. Journal of Economic Research 9 (33): 129-163. (In Persian). Khamseh, A. 2009. Importance of development & innovation centers and their management. The 3th National Conference on Management of technology. (In Persian). Mahdavi, M. 2010. R&D Management. Community R&D centers of industry and mining, Tehran. p: 16-23. (In Persian). Rahimi, F., and Gogerchian, A. 2012. Overflows of large trading partner’s R&D and Innovation on IRAN economic growth (2009-2000). (In Persian). Sadafi, M., and Daghbandan, E. 2002. Performance Evaluation of R&D units in terms of their goals in the industrial sector. Master's thesis, Islamic Azad University of Rasht. (In Persian). Soleymani, E., and Barati, M. 2014. Challenges for Agricultural Research in Iran. Studies Research Center of the Iranian parliament. Vice president of infrastructure research and production affairs. Code: 250. (In Persian). Wiley, John. 1990. Management of Research and Development Organizations Managing The Unmanageable. A Wiley Inter science Publication. 268pp.